Is there travel insurance coverage for the government shutdown? The ongoing government shutdown has already become the longest in U.S. history, and is disrupting travel nationwide. With hundreds of thousands of federal workers left without salaries, staffing shortages among TSA agents and air traffic controllers are leading to longer security lines and lengthy delays at major airports. Unfortunately, travel insurance will not provide coverage for travelers who are delayed or miss their flights due to longer than expected lines at security checkpoints. Squaremouth explains why travel insurance will not provide coverage during the government shutdown. TSA absences resulting from the lingering government shutdown are leading to major airport delays. In some cases, the lack of staff is even causing airports to close entire terminals altogether. To accommodate for these delays, major airports are recommending travelers arrive at least 2-3 hours early for their flights. However, even if you do arrive well ahead of time, missing your flight because you got stuck in line at a security checkpoint is not covered by any travel insurance benefits. Why isn’t Travel Delay coverage available? Most travel insurance policies have Travel Delay coverage to cover the expenses incurred for food and lodging during the delay. This leads many travelers to believe that any delay is covered. However, this is not the case. The most common covered reason under Travel Delay is a delay of a common carrier due to inclement weather or a mechanical breakdown. Other covered reasons include being involved in a traffic accident on the way to the airport, lost or stolen passports or travel documents, or an injury or sickness that causes you to be late. However, delays in line for a security checkpoint are not covered. Why isn’t cancellation coverage available? Unfortunately, if you miss your flight due to long security lines and decide to cancel your trip altogether, you will not have coverage for your trip costs under Trip Cancellation. This benefit is designed to refund travelers for their prepaid and non-refundable trip expenses in the event they cannot travel due to an illness, injury or death, terrorist attack, severe weather or natural disaster, or other reasons specifically listed by their policy. 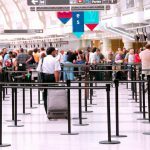 Longer than expected security lines that force you to miss your flight are not listed as a covered reason by any policies. Even if you purchased the Cancel For Any Reason upgrade, you will be out of luck if you wish to cancel once you arrive at the airport. This benefit requires you to cancel at least 2-3 days before your departure date.